In early August, 1967, a nine-man team from A Company, 3rd Reconnaissance Battalion, 3rd Marine Division began a night reconnaissance patrol in the A Shau Valley that was spotted by a Montagnard tribal woman and child, who alerted a nearby North Vietnamese unit. North Vietnamese troops slowly surrounded the Marine patrol and another that had joined it, trapping them for two days in hopes of luring a helicopter rescue. The following day (August 3), the first of two helicopters arrived and loaded some men from the patrols, but was hit by a bazooka shell and crashed during takeoff. The pilot was killed by small-arms fire. The nine passengers were believed to have perished, but all of their bodies could not be recovered because of hostile fire. John Nahan and Jack Wolpe were passengers aboard the aircraft. They were two of the A Company Reconnaissance patrol. Thomas Gopp was crewchief of the helicopter. 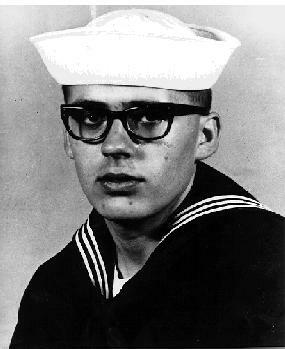 James McGrath was a U.S. Navy hospital corpsman attached to H & S Company accompanying the Recon team. These four were listed as Killed in Action, Body Not Recovered (KIA/BNR). The men of the CH46A shot down on August 3, 1967 are listed with honor among the missing because no remains were found. Their cases seem quite clear. For others who are listed missing, resolution is not as simple. Many were known to have survived their loss incident. Quite a few were in radio contact with search teams and describing an advancing enemy. Some were photographed or recorded in captivity. Others simply vanished without a trace. Reports continue to mount that we abandoned hundreds of Americans to the enemy when we left Southeast Asia. While the men aboard the CH46 may not be among them, one can imagine their proud willingness to fly one more mission to help bring them to freedom. 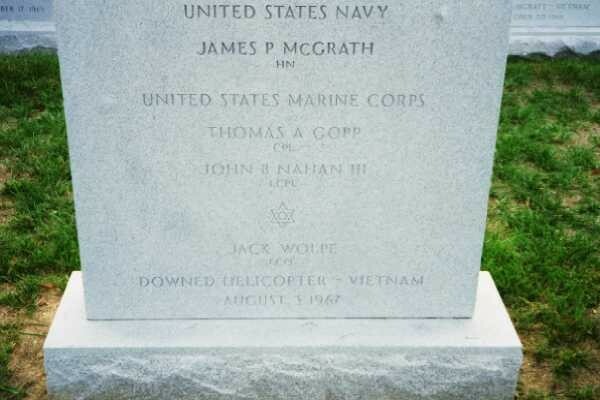 There will be a memorial service at Arlington National Cemetery at 1100, 9 November 2001 to inter the remains of Tom Gopp (HMM-164), Jim McGrath, John B. Nahan III, and Jack Wolpe. HQMC is handling the arrangements. The honor guard will be from Marine Barracks, 8th and I. NOTE: The Ceremony is currently scheduled for 1100 in the Fort Myer Chapel on Friday, 9 November. We will post additional information here as available. It is recommended that you check back here before making firm plans, and call the cemetery administrative office if weather looks like it will be an issue. Interment Location: The Interment will be in Section 60 off of Bradley Road. The remains of THOMAS ALAN GOPP were recently returned to his family and he now rests in honored glory in the OHIO WESTERN RESERVE NATIONAL CEMETERY in Rittman, Ohio. He became the first Missing in Action serviceman to be buried at this National Veterans Cemetery which marked its first anniversary on 19 June 2001. The remains of John Benedict Nahan III were laid to rest in the Church Cemetery of the Sacred Heart Catholic Church in Watson Township, Michigan, on Saturday, 18 August 2001. The remains of James Patrick McGrath were laid to rest with Jack Wolpe at Arlington National Cemetery on Friday, November 9, 2001.